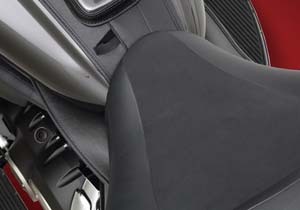 AS-1: Designed to provide heat relief for the rear cylinder. Heat is generated at the exhaust valve and exhaust pipe. The rear cylinder and rider's leg never gets a break...until now! It takes ~60 seconds to install: remove the air cleaner mounting screw (make sure you keep the air cleaner cover in place), then using the allen wrench, put the screw in the mounting hole of the scoop and install the screw in the air filter assembly and tighten it, making sure the scoop is centered. 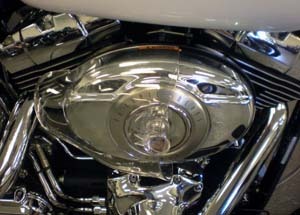 As the motorcycle travels, air will be directed onto the rear cylinder. 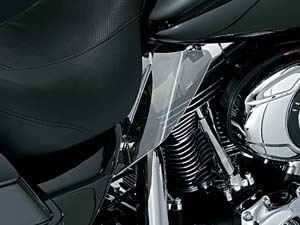 The faster the motorcycle goes, the more air flows onto the cylinder head and exhaust pipe area right below the rider's leg. 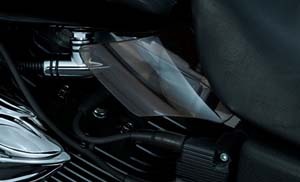 The scoop is made of tough polycarbonate, has UV protection and it's clear so you can see the chrome air cleaner cover, or customize it to your own taste. 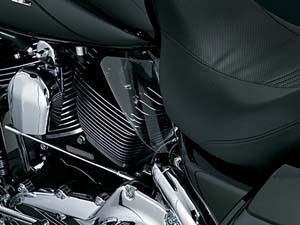 Fits Harley Twin-Cam engines with the football-shaped air cleaners. Made in USA. 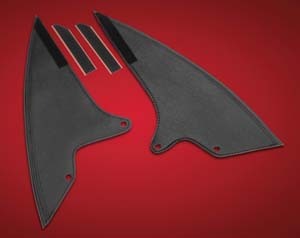 SS-51: Windshield air deflector set with black finish to direct heat from mid-frame area. Features a chrome trim. 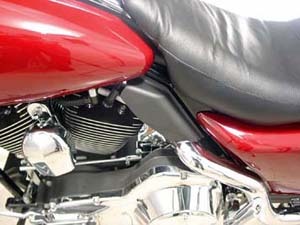 Mounts to the frame below the seat for rider's comfort in the heat. The mounting hardware, the thumb screw, must be ordered separately. Fits:FLT 2009 and up. 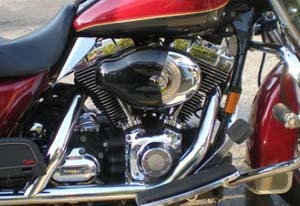 SS-2-9: Even though Harley-Davidson has gone to great lengths to reduce the heat felt by the rider on the '09 to current, there is no getting around the fact that you are straddling 96" of V-Twin power. 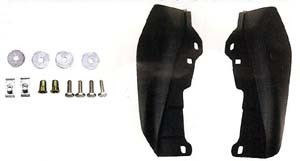 These patented heat shields are quick and easy to install & do an incredible job of keeping the heat generated by the rear cylinder off the inside of your thighs. 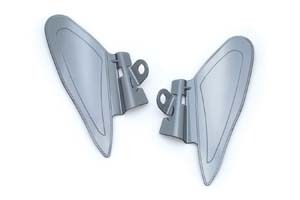 Saddle Shields: Ever sit in stop-in-go traffic or at that 4-way stoplight that never seems to change on a hot summers day and the heat coming off your motor is just about unbearable? Well we have the solution with our frame mounted polycarbonate shields that are perfectly positioned on the frame to dissipate and re-direct the heat away from you and your thighs. So on your next hot weather outing, let us recommend a pair of our Saddle Shields to help you enjoy your ride no matter how hot! Easy installation with no bike modification. 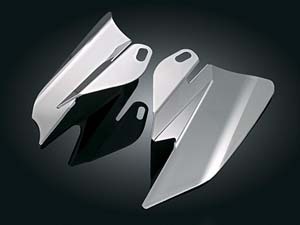 Fits '97 through current Electra Glides, Street Glides, Road Glides and Road Kings. 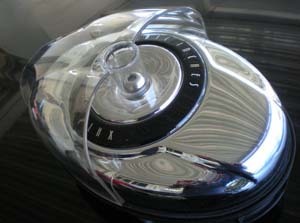 Our SS-B-9 version fits the new '09 model year through current. SS-T-9C: Trim for our SS-B-9 saddle shield. Designed for severe duty and extreme temperature applications. Made from black ABS plastic. 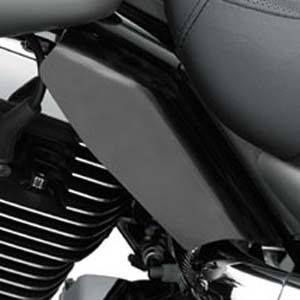 Attaches to the frame below the seat and diverts heat away from the rider on our SS-B-9. Easy installation with all hardware included. 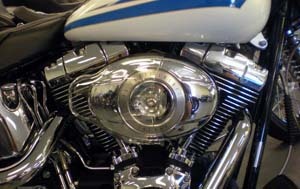 Also have a Softail, Heritage, Fatboy or Dyna? 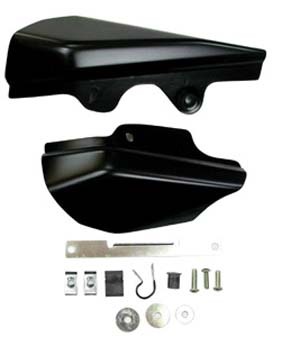 We also stock the SS-3 model which fits all Softail platforms (except the Softail Duece, Rocker/C) and SS-4 models for '99 to current Dynas and Switchback models. 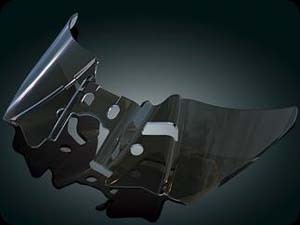 For additional cooling see our Vented Windshields, Air Deflectors, Lower Fairing Ultra Vent or Air Wings. 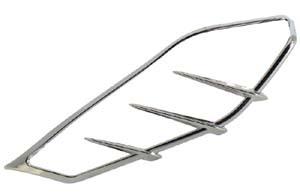 Extension pin kit: fits with '97 and up dressers. 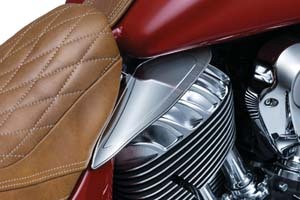 SS-5: Beat the heat produced by the potent Thunderstroke 111 powerplant with tried-and-true Saddle Shields, now available for Indian Chief, Chieftain and Roadmaster models. 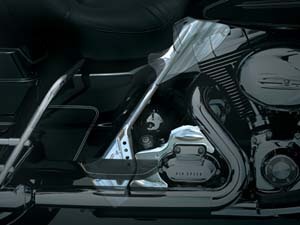 the frame-mounted Polycarbonite Saddle Shields redirect heat from the motor and head pipes away from the rider and passenger to increase comfort in stop-and-go traffic, on hot summer days and in warmer riding climates. Fits '14 to current Indian Chief Dark Horse, Classic, Vintage, Chieftain & Roadmaster Models (Except Scout). 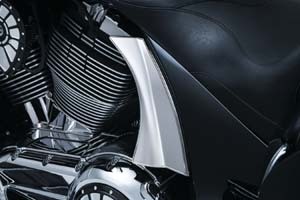 SC-80: Mask the rear motor mounts and instantly transform the look of your bagger with the Side Panel Scoops for Victory. 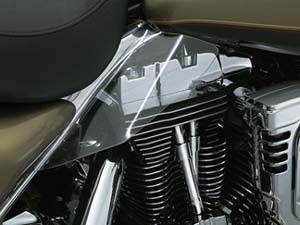 Simple installation using high-strength and high-temp 3M® VHB™ adhesive delivers a clean chrome upgrade to the side panel covers and the motor's back end. 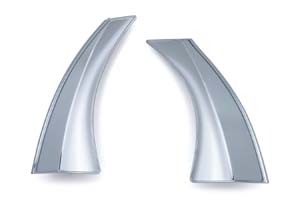 Made from lightweight, durable chrome-plated injection-molded ABS. 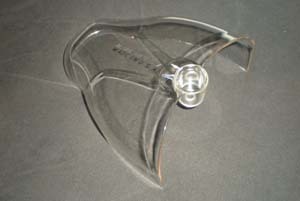 Provides a custom appearance to the side panel covers. Easy peel-&-stick installation. Fits '10 - '16 Cross Country, Cross Country Tour & Magnum Models, '10-'14 Cross Roads Models & 12 - '13 Hard-Ball. 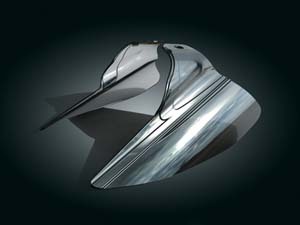 SS-124: Ease the heat when waiting for the green light on your 2018 Star Venture or Eluder. Made from bike matching marine grade vinyl. This part will not dry out and get stiff like leather. 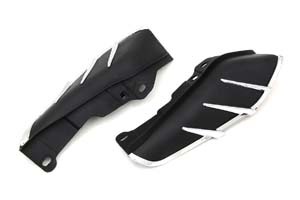 The edge is reinforced with multiple trim edges to insure it holds its shape yet will be soft enough not to cut into your leg while riding. 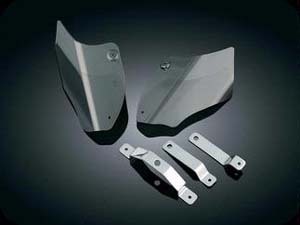 For Yamaha Star Venture and Eluder. Black Reinforced Edges. Made in USA. AS-1 Air Scoop for Right Side Comfort!